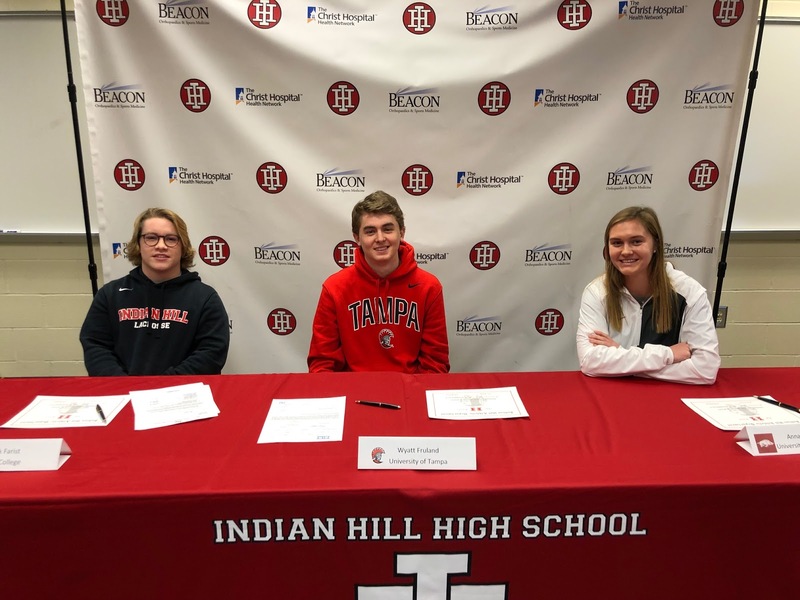 Indian Hill High School (IHHS) congratulates seniors and student-athletes Anna Podojil, Patrick Farist, and Wyatt Fruland who committed to continue both their academic and athletic careers during a College Signing Ceremony Thursday, November 29. Indian Hill High School student-athletes Patrick Farist, Wyatt Fruland, and Anna Podojil, committed to advance both their academic and athletic careers during a College Signing Ceremony Thursday, November 29. Anna Podojil is the reigning Gatorade Player of the Year and two-time Miss Soccer Ohio Player of the Year; she was a member of the back-to-back Ohio Division II Lady Braves Soccer State Championship Team. Podojil holds the school record for goals in a career (117), and she is second in school history with assists (51). She also holds the school record for goals in a season (38) set in 2017. In addition to her record-setting soccer career at Indian Hill High School, Podojil is also a State Champion in track. Patrick Farist is a 4-year varsity Indian Hill Lacrosse player who has earned All-State two times (2017, 2018). He is a three-time All-Region player (2016, 2017, 2018), and a 2-year varsity letterman in wrestling. Wyatt Fruland has earned a number of accolades during 2018, including: First Team All-State and Region; Regional Attackman of the Year; First Team Greater Cincinnati All-Star; Team MVP; and he tied the state record for points in a season (127). Additionally, Fruland was First Team All-State in 2017; he is a 4-year varsity lacrosse player.